Happy 2018, I’m currently in the middle of designing 3 bathrooms for a lovely client so I thought it was the perfect time to share with you a few tips and ideas as so many of us have removed the Christmas decorations and started to see our homes again in a different light. Winter makes me want to soak in the bath for hours with a candle and a good book and I feel a bathroom needs to be designed with a little wanderlust in mind. You can take inspiration from a luxurious hotel and their use of opulent materials or by taking a few tips from stunning spas with their scents, reflective surfaces and natural woods and then make it your own. You need a sense of glamour and luxury to help soak away the stress of the day. But in turn when you are rushing to get the family out of the house in the morning, washed and dressed you need to consider the logistics and design the layout to make it easy to reach the towel from the shower and not make the floor soaking! A bathroom layout is key. You want to create a sense of space, a light and airy feel so you can move around freely. Don’t try and cram too much into a small space. Be practical in your space design and plan the layout to make the room a comfortable haven. Smart storage solutions are vital for a decluttered bathroom. 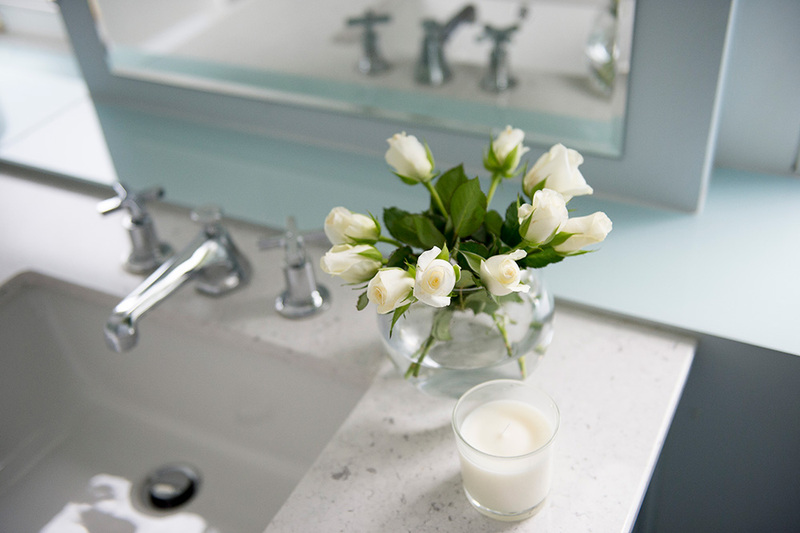 If you are designing a contemporary bathroom, look at added recesses or hidden storage to hide away the boring everyday stuff and display the prettier things. Think about your lighting and how it complements the layout. Remember to have lighting just in-front of your face so you can see when putting on your make up, a lit mirror or wall lights can create a stunning center piece to a bathroom. 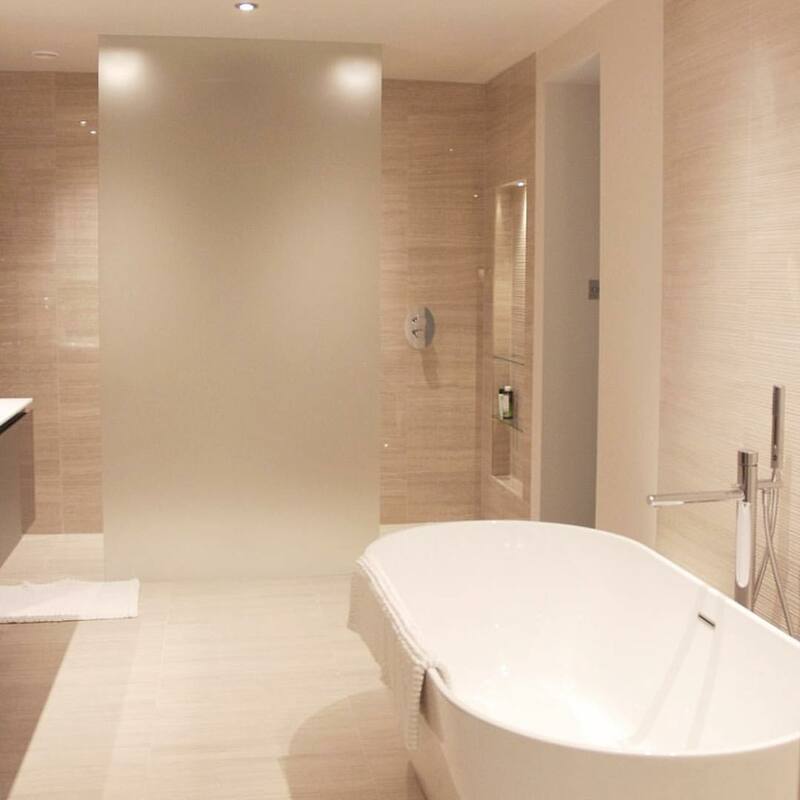 I like a bathroom to feel like an extension to your living space. It does not need to be tiled wall to wall, ceiling to floor, but it can be softened with paint or by adding pattern and texture. Matt paint such as Little Greene’s Intelligent matt emulsion and stunning wallpapers will add texture and a material finish looks stunning in a bathroom. Tiles have become more gorgeous and interesting allowing you to play around with different sizes and finishes within the same pallet. Try and mix different finishes such as a Carrara marble and a wood finish such as an oak for a stunning and timeless style. I’m currently using the new Mimica Statuario Venato Matt from Mandarin stone, a stunning large format matt porcelain Carrara style tile which I can’t wait to share the photos of with you. Don’t worry about the size of the room, you can use a dark colour in a small bathroom or cloakroom as it will create a cocooning environment. 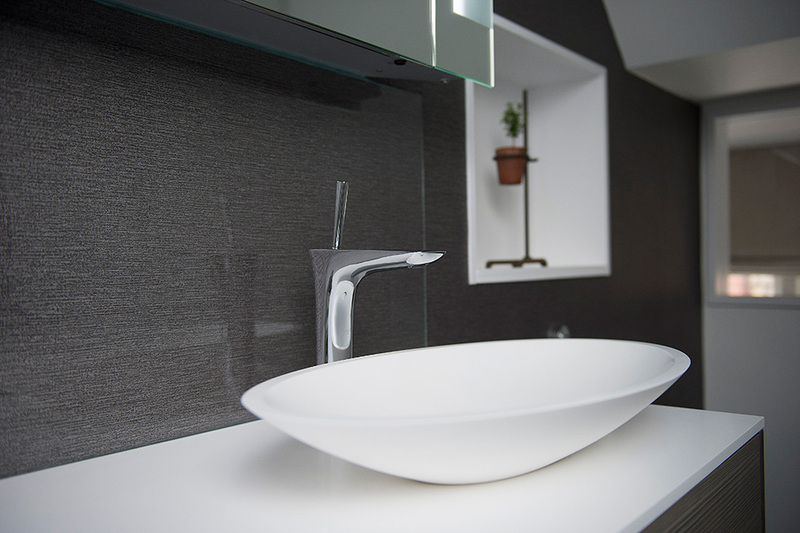 A darker wall colour contrasted against white sanitary wear to create a sharp and contemporary look and feel. Select a colour palette that makes you feel relaxed. As a starting point consider looking at the colours of the seasons and which season you can relate to the most, for example warm tones for summer, luxurious white on white for a winter feel. Colour is so personal, select a colour by how it makes you feel. In a bathroom, you should feel your most Zen ready for another day. 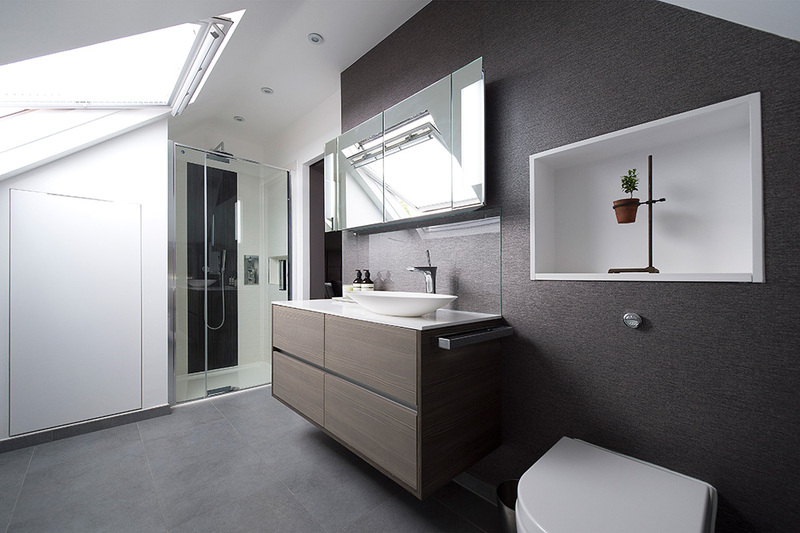 This entry was posted in Uncategorised and tagged Bathroom-design, bathroom-interior, nikki-rees, nikki-rees-interior-design, Wimbledon-interior-design by n1kkir33s. Bookmark the permalink.